Get Ready Today for free Online Embroidery Classes Tomorrow! I apologize for popping in unannounced on a Sunday afternoon, but this particular information is time sensitive, so I wanted to let you know today, so you can be ready tomorrow. How would you like to have free access to all of Craftsy’s online hand embroidery classes for one day? Tomorrow, September 4th, is All You Can Watch Day on Craftsy, which means you can access any of their online classes for free all day long, from your computer or from the browser on your tablet. Now, I know you probably won’t spend the Whole Day streaming online embroidery classes, but it’s a great way to explore thoroughly any particular Craftsy classes that interest you. Read on, and I’ll tell you what you have to do today, to get in on it tomorrow! 1. Read the information about All You Can Watch Day here. There are some restrictions (explained on the information page), including that it’s view-only (you can’t download class materials, PDFs, and the like). But hey, it’s a great way to explore full classes for free! If you want to look for specific hand embroidery classes on Craftsy, here’s a list of them that you can search for, once you get into the All You Can Watch “portal” on Monday. I’ve included links to my reviews after the ones I’ve reviewed, in case you want to see what they’re all about. 1. Stumpwork: Raised Embroidery Essentials – for beginners and beyond in stumpwork, taught by Celeste Chalasani. Here’s my review. 2. Goldwork Embroidery: Essential Techniques – for beginners and beyond in goldwork embroidery, taught by Lucy Barter, RSN graduate. It’s an excellent introductory class. Here’s my review. 3. Design It, Stitch It: Hand Embroidery – suited for beginners or those who want to re-learn skills they learned a long time ago! Covers the basics and lots of stitches. 4. Embroidering Texture & Dimension by Hand – geared towards appliqué and textured stitches, felt layering – lots of color, lots of fun! 5. Bead Embroidery – an accessible introduction to incorporating beads into your embroidery projects. 6. Bead Embroidery: Beyond the Basics – takes you deeper into bead embroidery and shows you how to create really encrusted bead pieces. Full of tips and techniques that you might not find in any one book. If You want In, Register Now! 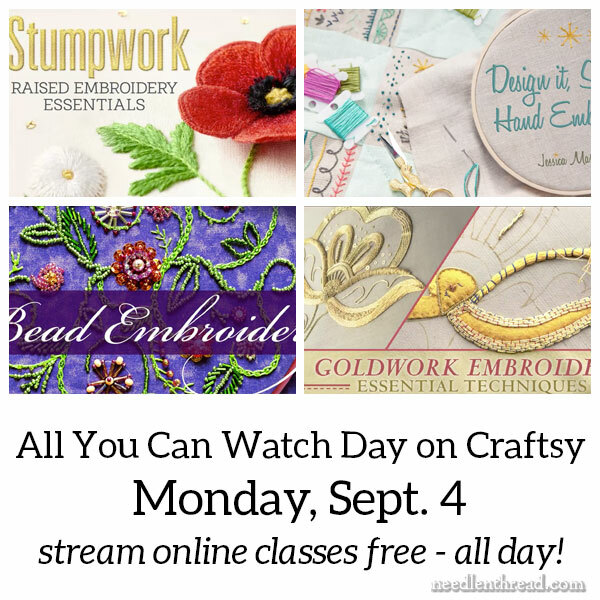 So, if you want to enjoy the holiday tomorrow learning new embroidery techniques, check out the All You Can Watch Day information, and get registered on Craftsy today! I use affiliate links whenever I link to Craftsy, because I get a tiny kickback that helps support Needle ‘n Thread. There’s absolutely no purchase necessary for All You Can Watch Day. I’m just letting you know about it, in case you’re interested! September 3, 2015 Goldwork Embroidery Class: Online, Self-Paced, and Affordable! Awesome news!! Thanks for the tip! Glad the hubs is remodeling and doesn’t need my help!!! Thanks so much for this. I’m a Craftsy member but long ago unsubscribed from their promotions as it was wasting too much time and I already had a que of classes waiting for me to finish. Since you let us know ahead of time, I was able to pass this along to my daughters in case they are interested in signing up since ALL the classes are on sale. I haven’t as yet been able to interest them in embroidery, but maybe a granddaughter will. For myself, I think I’ll skim through the ones I’ve favorited to see if I’d really like them and maybe listen to one on speed knitting as I diligently knit a fine lacy baby blanket for a grandson who is showing up this month. Thank you. I am midway through a Craftsy marathon!!! I saw that and thought I would look at the calligraphy classes as well, two great minds think alike. I’m afraid I marathoned too – sore eyes today but haven’t had so much fun in a long time. Found some fabulous classes but also did some culling of the favorites list. Happy Labor Day Monday – Here’s hoping the day is not too laborious for you. I love it, every time I come to your blog I learn something new or find something different to explore. This morning I have been waiting for the day to get light enough to go “labor” out in the garden before the temperature reaches 75 (which is my max for doing heavy work) and have spent a couple of hours roaming around your different entries and what a pleasant couple of hours. I’ve read about silk threads and thimbles in all their different varieties. There will probably be more reading later when it gets hot before moving on into my sewing room. Thank you so much for your pleasant, enlightening and fun company each day! Hi, Brenda! A happy holiday to you, too! The garden sounds like a pleasant place to be – although we’re supposed to be in the mid-90’s today. Aaaack! Well past my max for outdoor delights! Tomorrow, though, we plummet to the mid-70’s, and hopefully, the beginning of some nice pre-autumn weather. Crisp nights, sunny days – my favorite time of year! I’m so glad you enjoyed browsing Needle ‘n Thread this morning! Hope you have a most enjoyable day! Saw this this morning went straight on to Craftsy and watched some of the Stumpwork videos I shall continue this afternoon watching stumpwork which I am very interested in. Thank you so much for sharing with us the information on free access to all Craftsy classes videos today, it was such a lovely Monday morning surprise and wonderful news. Thanks. And what did I do today, you ask? Well, let’s see I watched Craftsy most of the day and enabled myself to three new or advanced techniques of stitching. I now understand Ribbon embroidery better; bead embroidery is more to my liking and before I go to sleep tonight I will understand scrumbling. Thank you Mary, for a very informative day of watching. And thank you also for reminding me I have purchased two other classes I need to start on one of these days…You are the greatest enabler. Thank you.